NOTES: Red brick building, approx. 3 blocks up the street from the Glenside train station, on the same side of the street as the train station. There is limited parking at Newgrounds office, but additional parking is available in or near the SEPTA lot. There is also plenty of street parking on Glenside Ave and Easton Rd. iSepta is a great mobile resource for train schedules. Space is limited so, please RSVP here so we can get a handle on headcount. There should be plenty of lively discussion. Hope to see many of you there to help us kick off our series of 2011 meetings in style. 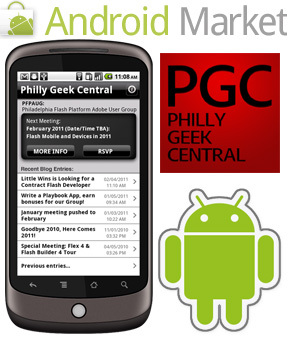 I finally spent a few minutes and published an Android version of PhillyGeekCentral. It's based on the exact same AS3/Flash CS5 code that I wrote for original iOS/iPhone version, with just a few minor tweaks. (I'll be updating the repository on Github to include the Android based tweaks, as soon as I get a chance). I really only had a chance to test it on my Nexus One, so it may be be a bit funky, and not lay out as nicely on other Android devices or tablets, but I'll make sure to address that in version 1.1 that I am working on. Feel free to send comments and feedback my way. I just wanted to get something out the door to motivate me to get going with cleaning it up, polishing it, and to work on the next version. I put it together with the very first beta of the Packager for iPhone in 2009, and once Apple banned that for a while early last year with changes to their Developer SDK agreement that everyone knows about, I pretty much hadn't let it languish until last September when they lifted the ban and approved an update. Now that's behind us and Adobe is working on the Packager to have parity with the rest of AIR for Devices, it motivated me to get going on it again. I also thought it would be a good tie in for our next meeting on mobile/devices and Flash, which I am nailing the new date down shortly. The app is available now in the Android Market, link can be found on this page I also submitted it to the the Amazon App store, and it's currently under review. There are some issues with AIR for Android and Amazons App Store that Adobe and Amazon are hashing out, so it may not get approved their right away - will update things when it is. The plan is for 1.1 to have a solid codebase with improved views, touch/swipe controls for both iOS, Android and Playbook devices in one branch with some conditional compilation directives, and then version 1.2 will finally introduce support for other local Adobe User Groups in the area. The roadmap for 1.3 is to then add support for other select local tech groups (along with a WordPress plugin), and then finally in 1.4 or perhaps 2.0, configureable group selection. Lots of clean up and optimizing to do first, especially around touch/swipe controls - which I am just not happy with right now (and have a totally different approach I am going to leverage) - but it's at least functional. I am not 100% certain of is how I'll optimize the UI and extra real estate for iPad and Android tablets like the Samsung Galaxy, and the upcoming BlackBerry Playbook and other larger form factor devices. I may come up with a totally different layout and views. The UI itself was originally designed to mimic that of the iPhone/iOS which was originally a Cocoa/Xcode app before I ported it over to AS3. However, I may also move away from that entirely with the Android and Blackberry versions. The icon could certainly be a lot nicer to - all things I pretty much skimped on getting it out the door originally back when the iPhone Packager was still in beta and before Apple dropped the hammer on things. Lots to ponder and tweak now that things are much further along. Another related topic I wanted to touch on, and will get into more detail in our next meeting, is how incredibly easy it was to take the iPhone version I developed and tweak it just a bit for Android, that literally only took about an hour, mainly due to the different size dimensions of the Nexus One versus iPhone's and their PPI differences, which again are not fully accounted for, but werent accounted for at all in the original iPhone version. I also added a few other minor Android specific items. Debugging and working with AIR for Android in Flash CS5, is so much easier, and faster than my original experience with the Packager for iPhone, but Adobe is really working hard to give everything parity and polish for the next release. The biggest difference for me, was more about the developer portals and not so much my local developer tools. I was blown away by how incredibly simple it was to use the Google Android Market, and Amazons AppStore Developer Portal to submit the .APK files for publishing. It literally took me less than 5 minutes to sign up for each of them and get my accounts created, and since I had all my assets ready, filling out the forms, and submitting the icons, screenshots and .APK file also took less than 5 minutes. The Android Market place had my app up by the time I picked up my device and did a search for it. Amazon has a more Apple like review process, and as I mentioned there are potential issues with AIR for Android apps that needs to be ironed out - but overall but processes were so much more streamlined than working with Apples iOS Developer portals. To be fair, I've used Apple's stuff enough for it to be old hat, and they have made a lot of progress since it first opened, but for beginners out there, Google and Amazons dev portals are much more approachable and easier to use. Apple could take some lessons here. I also love that you can now browse the Android Market on the web and push files to your device - same thing with Amazon's app store - Apple is half way there - in that you can at least browse apps on the web, but you still get pushed to iTunes. It would be nice if you could also do a push that would queue up a download in the app store on your device - think about that Apple! Since my next task is to finish up a Blackerry Playbook version of the app, its worth noting that Blackberry's Developer/Vendor portal thing is absolutely terrible, and even worse when compared to Apple, Google or Amazon's developer portals. As of right now I can't even login to my account, and their validation sounds like its just as backwards as Apples process is for corporations. The site is completely confusing, redundant and overworked, in some cases simply doesn't work - and even requires Internet Explorer or Firefox only! What year is this anyway? Just a terrible experience overall, they really could do a lot better, and as much as they are embracing the Adobe/Flash community and opening their doors to developers - they need to improve their portal and developer offerings. Also their developer costs for submitting apps (granted they are free for a short amount of time) are geared at enterprise developers (not to unsurprising given their past focus) but I feel they need to rethink this as well going forward and make it more on par with Apple, Google, etc. More on this at our next meeting. Our Co-Manager and good friend J. Marziani and his company Little Wins are looking for a contract Flash Developer to work with them out of Indy Hall for approx. 3 months - interested? Check out the craiglist posting for more details.